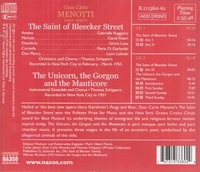 “The dynamic cast of THE SAINT OF BLEECKER STREET, under wunderkind (and Menotti protégé and paramour) Thomas Schippers, clearly gave thrilling performances: that fact jumps from the recording that RCA has now reissued. But there was some backlash from the Italian– American community, as Menotti took on and ‘showed in public’ some aspects of social and familial structures in Little Italy that many might have preferred to leave unexamined. SAINT, with its gang violence, shunning, fervent religiosity and implicit core of incestuous feeling, is not easy sledding — nor should it be. Unlike THE CONSUL, the piece resists updating (it makes no sense in a post-Vatican II setting) but has won occasional skillful and gritty revivals, especially at New York City Opera, where it was long a feature. Menotti cared nothing (at least at this point) for Darmstadt-dictated modernism; his musical vocabulary is tonal and tuneful and cannot be said to aim ‘high’. Listening at home, one hears very clearly the traces of Mussorgsky, Puccini, Mascagni, Richard Strauss, Respighi, Bartók and Stravinsky, among others. But as a piece of veristic grand guignol, SAINT can be surprisingly effective in the theater.